Notice: Please be aware that there are a number of invasive spammers on my blog. Hopefully in a week’s time, every unimportant comment contribute by these people will be appropriately be deleted. Know that I had no involvement with these spammer’s tactics. There exists in a cyber world Gaga Zombies, inspired by Lady Gaga, who spew out their intelligible drivel in computer hieroglyphics or fragments of terrible Gaga lyrics. Thanks for your understanding of this grave and annoying situation!! As a glassmaker and a magician-in-training, Opal Cowen understands trial by fire. Now it’s time to test her mettle. Someone has sabotaged the Stormdancer clan’s glass orbs, killing their most powerful magicians. 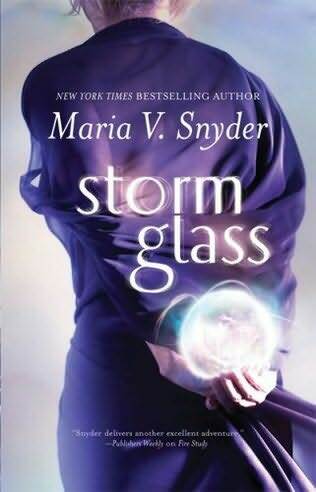 The Stormdancers—particularly the mysterious and mercurial Kade—require Opal’s unique talents to prevent it happening again. But when the mission goes awry, Opal must tap into a new kind of magic as stunningly potent as it is frightening. And the further she delves into the intrigue behind the glass and magic, the more distorted things appear. With lives hanging in the balance—including her own—Opal must control powers she never knew she possessed… powers that might lead to disaster beyond anything she’s ever known. Review: Instead of seeing the story from Yelena’s eyes, Maria V. Snyder creates a new series, from the eyes of Opal. While the first series of books that introduced the fantastical worlds of “Ixia,” and “Sitia,” reflected Yelena’s character growth through the use the different modes of subduing or overcoming foes such as the stealthier means of using poison or magic dependent activated by one’s mind. (Oddly enough the last book seemed to represent a place of death rather than a tool of death.) With respects to Yelena’s character growth though, Poison Study detailed the restructuring of the ability to trust others by probing their minds for certain venomous qualities which could pose danger. Magic Study involved the rediscovery of her origins and finding familial love, after being redeemed from the toxic past that crippled her ability to trust others. Fire Study is where the fate of both countries she loves deeply are dependent on her ability to defeat the malevolent force that threatens the lives of countless people. Basically, she’s forced to find some technique to extinguish the fires that vie to obliterate everything she’s become deeply in love with. Interestingly, I only came upon this theory by thinking again upon the first trilogy of books as a one huge story, rather than three separate parts. In another post, I hope to post something that explains my theory that these books hold deeper meaning. Death’s usually an element of our lives that becomes a reality at the ending point. For Sam, though that ending point’s an imminent point within his life as he’s gift or cursed with the ability to see death. His affliction entreats him with the ability to see into the minds of humans and know the intimate details of the last page of their lives. With a government seeking to abduct him , a complex mystery surrounding his mother’s life and death, and a disorienting struggle over love; Sam finds that he cannot allow death’s malevolence to stall him. Because at this juncture, there are things far worse than death, existing in life.